NRCS assistance is accessed through one of California's 55 local offices. Wildfires, especially those caused by human activity, can take a tragic toll on the people and landscape affected. 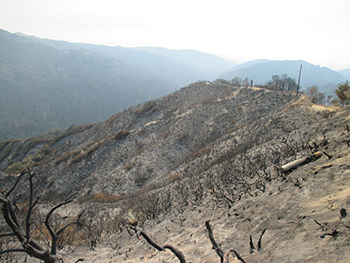 In California the wildfire season is typically followed by the rainy season presenting hazards such as flooding, erosion and more to the already fire- damaged watersheds and the people who live in them. One program available through NRCS is the Emergency Watershed Protection Program (EWP). This program is designed to help people reduce imminent hazards to life and property. All projects undertaken through EWP are done in conjunction with a sponsor, such as a city, state, county or other eligible party. It is not intended to assist individuals. EWP can pay up to 75 percent of the cost of emergency measures. Typical work includes removing debris from stream channels, culverts and bridge abutments; reshaping and protecting eroding banks; correcting damaged drainage facilities; repairing levees; or reseeding a damaged area. Link to EWP information. NRCS may also be able to assist impacted landowners and communities with technical information to help them return damaged watersheds to normal functioning. NRCS conservationists may be able to offer advice on preventing erosion, covering and protecting exposed soil, directing water away from vulnerable areas and more.